This time is different – this is a start that the reader might think Carmen Reinhart and Kenneth Rogoff could begin with – and yes, this time the reader really faces a new writer instead of the Ultra High-Frequency Trading oriented academic behind the pen name 7/.V. In due arithmetic progression, let’s call me 8RD+, a rather clumsy rendition of my real nickname since childhood. As a warning, I should probably point out that I am more into slow food than fast trading, more into marketing than into financing, and absolutely without education nor a job for that matter. Why Fitbit activity trackers are selling well? Why no-one has heard of Finnish biohacking company Firstbeat? Why everybody knows Swiss drug company Novartis? Why Coca-Cola has sold well over 100 years? I was contemplating on these profound matters one day sipping wine – even older invention than Coca-Cola – and listening to Gordon Sumner, better known by his stage name Sting. One tune in particular – ROCK STEADY – hit my ears from the same album that also contained song called FRAGILE. Kenny Kirkland was fabulous on piano – as always – but also the lyrics of ROCK STEADY appealed to my little grey cells. In the song there was a bearded man who made a PREDICTION about a flood, and build a huge boat to rescue the species at hand. In essence, the man made a bet against a perpetual sunshine. The reader should now be asking was it a rational bet – or investment – to build a rescue vehicle, an option to escape. The world seems to be flooding both water and refugees now in 2015, so topics like HEALTH and PREDICTION should captivate investors’ ears. Martin Armstrong – the academic turned prisoner turned lecturer – has also noticed this occurrence. Some might even remember that the former CEO of IBM, Lou Gerstner, used to say “Don’t tell me about the flood. Build me an Ark.” So which of the health-related industries will be the future winners? Will it be beer, cheese, vitamins, pharmaceuticals or electronic health-monitoring gadgets? According to media company Thomson Reuters the pharmaceutical industry is globally USD 1.0 trillion industry, and expected to grow to USD 1.3 trillion by 2018. For comparison, the Finnish biohacking company Firstbeat has a measly USD 2.0 million revenue, and even the global beer manufacturing is only USD 136 billion industry, a mere fraction of pharmaceutical industry. But why should the past performance determine the future? Aren’t there any variables at stake? The foundation of probability theory lies deeply in gambling, and one of the more famous examples was written already in 1494 by an Italian mathematician (and the Father of Accounting) Luca Pacioli. In his story two gentlemen were playing with dice, and the first to hit six wins should take the pot, a whopping 22 golden ducats. However, a twist arises. The game was interrupted, maybe their wives showed up, when one had 5 wins and the underdog only 3 wins. The question was, how should the money be divided in a fair manner. Luca Pacioli himself in 1494 suggested a split in 5:3 ratio, thus counting on past performance. But what we really are looking for is figuring out the odds what will happen in the future, a PREDICTION of things to come. So what is the likelihood of getting 6 wins for each player? It took Blaise Pascal and his famous Pascal’s Triangle in 1653 to get to the right conclusion. The player with only 3 wins now, should win 3 times in a row to get to six wins. The probability for this to happen is only 1 in 8 times, so the current leader should get 7/8 of the pot, a respectable 87.5 percent of the money. This is a case of three degrees of freedom. The reader will later realize why this particular case of three independent cases is so useful to know. For the sake of argument, let’s spin these same odds in the form of another example. Consider eight companies of same industry in the same competitive markets with three sub-categories. How do you expect the profits to be distributed? As markets should be full of surprises, unexpected events are close to random. Therefore the Pascal’s Triangle’s or Bell Curve’s cumulative distribution function should predict the profits. So in real competition there should be one clear winner of the eight, three somewhat above the average, three little bit short of the average, and one clear loser. If you have industry where all the eight players make phenomenal profits, then you should realize that the system is rigged. There is no competition, and the bubble is waiting to burst. Just remember what industry as a whole was profitable before the housing bubble which burst in 2008. Luca Pacioli’s example might be interpreted in a way that current leaders will prevail, and pharmaceutical industry will dominate, but this is not the way I see things. My background in marketing forces me to think about factors like market structure, strategy and timeframe. I don’t operate like the late trader Joe Siegel from Chicago. I like to know about things and the past, and then more. In a world where the refugee situation is worse than ever, Angela Merkel’s line got me thinking of the pharmaceutical industry in a different light, in the light of the marketing structure. The drug industry – like Novartis and GSK – operate in a Business-to-Administration (B2A) world, whereas companies like Fitbit, Jawbone, and Firstbeat operate in a Business-to-Consumers (B2C) world. The reader might object the labeling of pharmaceutical industry as B2A industry, because individual people ultimately consume – and in a sense even buy – the drugs. But the reason why I don’t find these people as consumers, is that the real decisions of the drug use is made in Medical Advisory Boards which make their recommendations for treating symptoms (I specifically restrain myself not to use the word diseases). After all, we use terrible amounts of statins, beta blockers and anti-anxiety drugs. Malaria is real a disease. Let’s examine the medical measurement procedure more closely. The reader might go to the doctor’s office maybe once a year, and he or she measures your blood pressure, blood sugar and cholesterol – the three common variables. With a fairly high probability the doctor comes to the conclusion that the patient is in dire need of some new prescription medicine that has just been launched to the market (new patent). The new patent doesn’t have to mean that the actual drug is new. Our case company Novartis just launched a drug called Entresto, which is a combination of two molecules – here comes the surprise – both invented in the 1990s. The parts are old, but the mix is new, hence the new patent and expensive price. All this with only a few measurements. Because the “Big Three Variables” change on a minute-to-minute basis, the odds are high that at least one of them is high when the patient visits the doctor. Blood pressure of course being highly sensitive to stress factors – like seeing a doctor – it is the most likely variable to be above the guidelines set by the advisory boards. Note that all these variables are only surrogate outcomes, the real expected outcome of course being HEALTH. Therefore it should be no surprise that the aforementioned ratio from Luca Pacioli’s example – 7 out of 8 – of people over 60 years use prescription drugs. 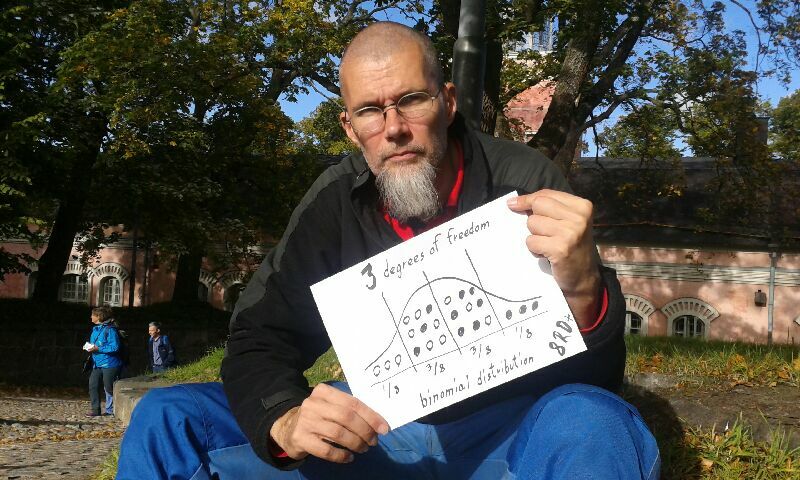 Three degrees of freedom and binomial distribution. Statistically speaking, the phenomena we are talking about is BLINDFOLD MEASUREMENT. Whereas in free markets the buying and selling decisions are in constant motion – HIGH-FREQUENCY MEASUREMENT – the advisory boards and democratic elections make their decisions only occasionally – in almost random manner. Furthermore, the few measurements that are made are not for PREDICTION purposes, but for CONTROL purposes. 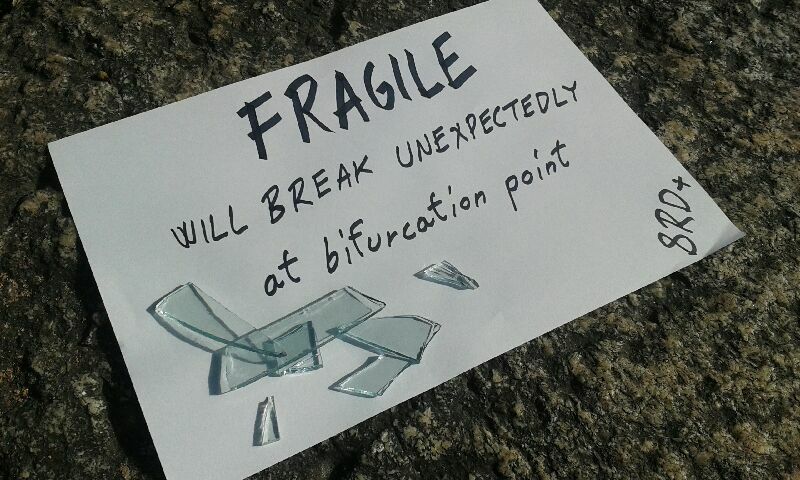 Fragility means here the vulnerability to sudden big shocks – while looking ROCK STEADY up to the point of crash. Therefore our pharmaceutical case company Novartis is liable to two obstacles: corruption to uphold the B2A structure with advisory boards and patents, and also public mood change to buy the idea of BLINDFOLD MEASUREMENT and the need for HOMOGENEITY through CONTROL. It is no surprise that Novartis has buried itself deeper and deeper into the world of kickbacks and legal shenanigans. At the moment the United States Department of Justice is trying to fine Novartis for USD 3.3 billion for giving kickbacks, a sum ten times bigger than the combined sales of Fitbit and Jawbone activity trackers globally. In short, pharmaceutical industry is FRAGILE. Biohacking – by nature – is the polar opposite of FRAGILE. Again using Nassim Taleb’s terminology, biohacking is ANTIFRAGILE. Companies like Fitbit, Jawbone and Firstbeat are measuring the consumer more or less constantly with HIGH-FREQUENCY MEASUREMENT – in one’s own wrist or chest – not at the doctor’s office once a year. And what is even better, the consumers make their buying decisions voluntarily without advisory boards or kickbacks. We are talking about B2C market structure – the yearning for freedom and health. Both Fitbit and Jawbone are measuring activity – rather traditional approach – but the Finnish company Firstbeat is measuring heart rate variability – HRV for short – at 1000 Hz sampling rate, which is far more useful approach to health. And with this massive data we are now making PREDICTION about future HEALTH, not trying to CONTROL or aiming for HOMOGENEITY. The individual is here the self-directed system with learning capabilities, not a vessel that advisory boards regulate. The average reader – while popping beta blockers and anti-anxiety pills – might think that ROCK STEADY and average are good things, like monthly salary and steady return on investment (no depressions or stock market crashes ever). 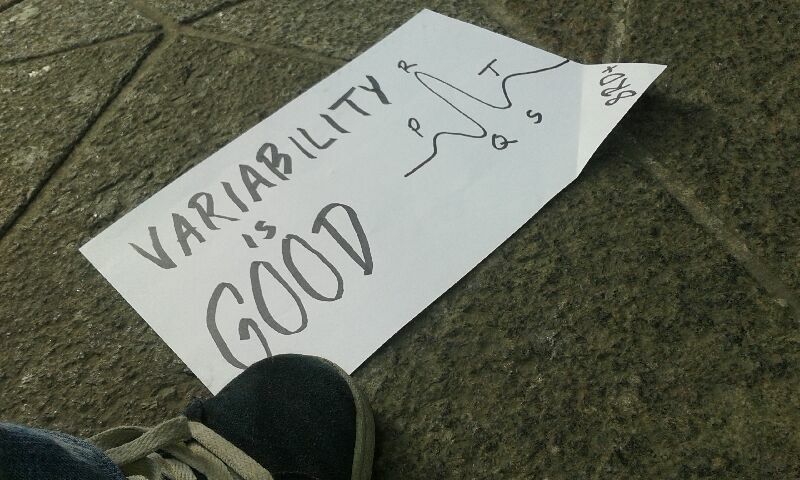 But actually variation is good; it’s nice to have holidays, and after every crash there is a boom, sooner or later. This is also the basic discovery behind Black-Scholes option pricing formula – that volatile stocks should have higher option prices. Robert C. Merton (the hot rod guy) and Myron S. Scholes (the Canadian computer guy) both received Nobel Award in Economic Sciences in 1997, but it had taken years to get the now-famous formula even published back in the 1970s. Again a testimony that advisory boards – in the form of peer-reviewed magazines in this case – can be tricky. Now in the 21st century we even have VIX, the Volatility Index – also known as the fear index. To accentuate the theme of variability, Myron Scholes, in December 1997, held one of the most boring Nobel Lectures ever given, which ended in the following sentence: “In a world of information asymmetries, derivative instruments provide lower cost solutions to financial contracting problems in a dynamic environment and these lower-cost solutions enhance economic efficiency.” As the reader could already figure out from this tantalizing quote, the lecture was enticingly titled: “Derivatives in a dynamic environment”. In medicine already in 1965 two obstetricians named E. H. Hon and S. T. Lee made a startling discovery that babies born with steady heart beat died more easily than the ones with slight irregularities. A concept called heart rate variability (HRV) was introduced, and everybody should have realized that something steady is always a sign of stress and belongs to a field of control engineering theory. In Finland we used to have this mobile phone giant Nokia – I’m not a fan of Olli-Pekka Kallasvuo or Stephen Elop – and because of that, quite a few people with electrical engineering and programming skills are available. But the idea of measuring variability of adult’s heart beat came from the world of sports physiology. A renowned physiologist Heikki Rusko was part of a team that understood how vital it is to avoid overtraining, and even design compact gadgets to monitor HRV, R-R intervals to be more precise. The company Firstbeat was established over ten years ago in 2002. In the world of sports, Heikki Rusko is almost as famous as David Costill or Jack Daniels – not the whiskey – and the patent was licenced to bigger manufacturers like Suunto, Polar, Garmin, and Samsung – with the help of Firstbeat CEO Joni Kettunen and CTO Sami Saalasti. The use of HRV technology is common in professional sports, and many NHL hockey teams like Chicago Blackhawks – Stanley Cup winner 2010, 2013, and 2015 – utilize it on a day to day basis. But where there is variability, there is also patterns and cycles – the things that Martin Armstrong studies – and cycles can be of different lengths. Just as in economics – like Kondratieff and Kress cycles – or in sunspots or lunar phases, the longer cycles are more important than the short ones. In heart rate variability, the longest cycles have the best correlation to mortality and general feeling of HEALTH. You really don’t want to be overtrained or overstressed. There is more than 31 million seconds in a year, and when you sample that with 1000 Hz frequency you can make pretty good PREDICTIONS. Biohacking can save lives – and it should also make money in the future. I prefer variability in both eating and drinking too. Water, organic full-fat milk, beer, and wine at alternate meals is way better than skimmed milk at every occasion. While I often talk about Coca-Cola I never actually drink it, but more of the marketing of Coca-Cola will be covered in the next chapter “Corporate Affairs”. Still we often seem to be addicted to stability, even to a fault. In a case of other kind of variability in eating, an Englishman named Michael Mosley – doctor turned BBC-producer turned writer – showed that variability can be a blessing. The world renowned 5:2 diet had it’s birth in August 2012 at a TV-programme called “Eat, Fast, and Live Longer”. Thousands of years old Jewish tradition of fasting two days a week was now a new thing invented by Michael Mosley. Publishing houses rejoiced and IP-rights were practiced to exploit thousands of years old invention. Remember also the Entresto case in chapter “The Berlin Wall Breakdown” in connection to fragility. Sometimes even antifragility moves in mysterious ways. 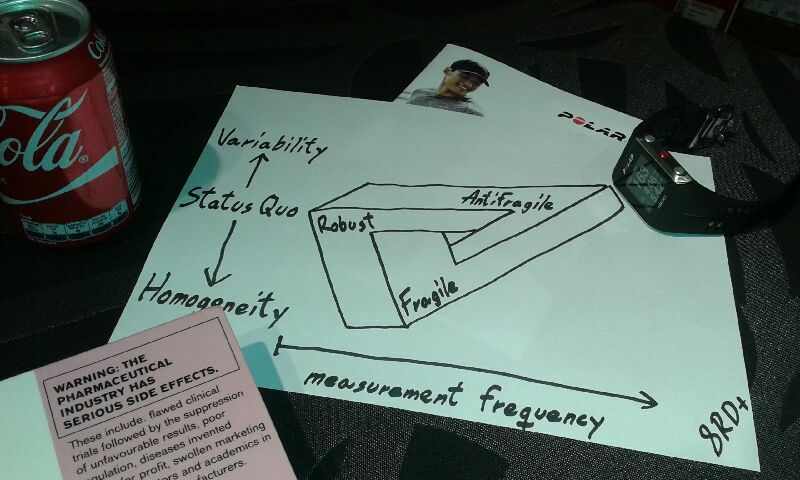 Up to this point, I have been tackling the FRAGILE and ANTIFRAGILE industries, but as the readers of Nassim Taleb very well know, there is also a third dimension in the pattern: the ROBUST. Whereas the FRAGILE relied on BLINDFOLD MEASUREMENT and the ANTIFRAGILE relied on HIGH-FREQUENCY MEASUREMENT, a can of Coca-Cola doesn’t measure you at all, nor do you need advisory boards to judge whether you are fit or sick enough to drink Coca-Cola. Coca-Cola is ROBUST – you can take it or leave, it’s your choice. The ROBUST industry is there to preserve the Status Quo – the idea that right now is good, and will be good in the future (and has always been good). Coca-Cola, Swiss cheese, and Guinness beer are not to be messed with. A clear demonstration of this happened in 1985 when Coca-Cola – after the clandestine “Operation Kansas” – tried to alter the original recipe for Coca-Cola and replace it with New Coke, advertised by Bill Cosby. The project was destined to founder from the beginning. You don’t mess with evergreens – you invent new evergreens – if you can. The birdbrained idea was to incorporate more high-fructose corn syrup into the classic soft drink – a genuine kicking donkey agricultural policy issue – and to refresh company brand image. Any sensible reader now wonders why Coca-Cola didn’t just launch a new product (like Big Pharma would have done) – why bother to risk and replace the age-old original. The reason was both self-evident and idiotic – two separate products would have split the Coca-Cola sales, and Pepsi would have been the leading brand, though not leader in company revenue. This kind of reasoning nowadays seems rather antiquated, but in those days the variability of selection was not so valued. Blockbuster product was the thing companies drooled after. A number of FRAGILE companies have noticed that being ROBUST can be a good thing. Some pharmaceutical companies – like Johnson&Johnson in United States and Orion in Finland – are distancing themselves away from the dangers of B2A world, and advertise more their vitamins, hormones, and prescription-free painkillers. All this despite the fact that Pfizer – mainly known for it’s cholesterol lowering drug Lipitor – made an eye-watering net profit margin of 42.65 percent in 2013. Coca-Cola managed to squeeze out 18.32 percent net profit margin in that same year, so being ROBUST is not as profitable as being a master in rigged markets, but it is a helluva lot safer option. Rigged markets always falter at same point, and fragility is often attached to a lawsuit. So ROBUST will be with us from here to eternity, ANTIFRAGILE is the trend of the future, and FRAGILE will always break eventually. And to rephrase the old serenity prayer I say to all my readers: God grant me the serenity to accept the things I should not change, the courage to change the things I should, and the wisdom to know the difference.